In this paper the author discloses the concept of a worldview and clarifies it’s meaning for humans from the Ukrainian representatives’ the Lviv-Warsaw School (LWS) (1895-1939) point of view. The subject of the article is determined on the one hand by the contemporary “battle for the philosophy” in Ukraine and on the other hand – by the attention of the LWS philosophers to the question of the essence of the worldview, caused by positivism that denied autonomy and peculiarity of man’s spiritual world and defined metaphysics as “conceptual poetry” or religious faith. The analysis of philosophical-pedagogical reflections on the worldview by Ilarion Sventsitskyi, Havryil Kostelnyk, Stepan Baley, Yakym Yarema, Oleksandr Kulchytskyi has been done in the paper. At the same time, a comparative analysis with the views of the Polish representatives of the LWS on the same topic, namely, with the views of Kazimierz Twardowsky, Yan Lukasevich and Tadeusz Kotarbinsky was conducted. It was found that the Ukrainian LWS representatives’ “worldview” is man’s desperate impulse to embrace the world as a whole. The worldview is person’s step to the highest living goods: wisdom and happiness. Such LWS philosophers’ approach to the essence of the worldview is based on a natural impulse of an unselfish desire to know the mystery of the world. Therefore, every human being has the ability to reflect the world in his/her own “I”. Special attention is paid to the fact that the representatives of the LWS defined the “worldview” as independent and autonomous. And only under such circumstances it can guarantee to a person cognition of the truth and creating the moral ideal. That, according to the Ukrainian scientists, can be promoted by acquaintance with the history of worldviews – metaphysics. This, in turn, leads to the interest of the general public, as well as its introduction into the curricula of secondary and higher schools. Undoubtedly, this involves a well-balanced approach to its study, which does not include learning other people’s views on the world, but promoting the design of their own. PhD, Associate Professor, Associate Professor of the Social and Economic Disciplines Department of the National Academy of State Border Service of Ukraine named after Bohdan Khmelnytskyi (Ukraine). Kostelnyk, H. (1931). The World as the Eternal School. Philosophical Reflections. Lviv [In Ukrainian]. Kulchytskyi, O. (1995). The Basis of Philosophy and Philosophical Sciences (ed. Karas A.). Munich-Lviv: Ukrainian Free University, Munich (first edition 1949) [In Ukrainian]. Kulchytskyi, O. (1985). Worldview and youth. In: Oleksandr Kulchytskyi. Ukrainian Personalism. Philosophical and Ethnopsychological Synthesis. Munich-Paris: Ukrainian Free University, Munich, 15-19 [In Ukrainian]. Svientsitskyi, I. (1927). The Science of Sciences. Dilo, May 5 (N 97), 2-3 [In Ukrainian]. Yarema, Ya. (1924). 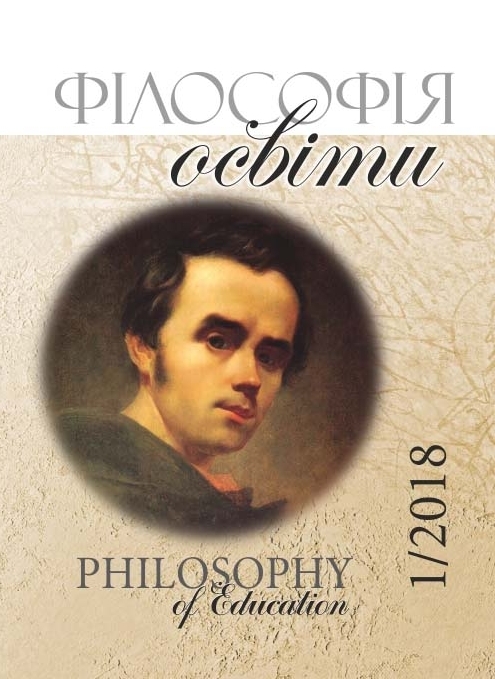 Introduction to Philosophy (Lectures notes on the 1 term 1923/1924 in Drahomanov Ukrainian Higher Pedagogical University in Prague). Prague: Drahomanov Ukr. Ped. University Press [In Ukrainian]. Baley, S. (1947). Drogi samopoznanie. Kraków: Wiedza. Zawód. Kultura. (wyd. 2-е). (first edition 1946) [In Polish]. Dąmbska, I. (1948). Czterdzieści lat filozofii we Lwowie 1898–1938. Przegląd Filozoficzny, XLIV, N. 1, 14–25 [In Polish]. Ivanyk, S. (2014). Filozofowie ukraińscy w Szkole Lwowsko-Warszawskiej. Warszawa: Semper [In Polish]. Kotarbiński, T. (1987a). Kultura filozoficzna. W: Tadeusz Kotarbiński. Pisma etyczne. (red. Smoczyński P.J.). Wrocław-Warszawa-Kraków-Gdańsk-Łósź: Zakład Narodowy im. Ossolińskich, 91–103. (first publication 1935) [In Polish]. Kotarbiński, T. (1987b). O urabianiu poglądów na żwiat i życie. W: Tadeusz Kotarbiński. Pisma etyczne. (red. Smoczyński P.J.). Wrocław-Warszawa-Kraków-Gdańsk-Łósź: Zakład Narodowy im. Ossolińskich, 104–105 (first publication 1947) [In Polish]. Łukasiewicz, J. (1912). O tworczosci w nauce. Ksiega pamiatkowa ku uczczeniu 250-tej rocznicy założenia Uniwersytetu Lwowskiego przez Króla Jana Kazimierza r. 1661. Uniwersytet Lwowski, Lwów, t. 1, 1–15 [In Polish]. Twardowski, K. (2013). Co to jest filozofia i po co się jej uczymy? W: Kazimierz Twardowski. Myśl, mowa i czyn. Cz. I. (red. Brożek А., Jadacki J.). Kraków: Copernicus Center Press, 484–488. (first publication 1904) [In Polish]. Woleński, J. (1986). Tadeusz Kotarbiński i szkoła lwowsko-warszawska. Ruch Filozoficzny, XLIII, N. 3–4, 243–252 [In Polish].